How long have you been into Sport Rocketry? 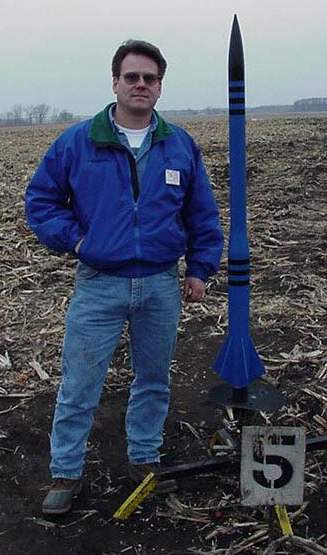 What attracted to rocketry as a hobby? "I always was interested in space and aeronautics. I also liked to build things so it was a natural fit. I guess the same still holds true as to what got me back into rocketry. Unfortunately our space program has not advanced to the point we thought it would back then." "I'm NAR #72312 and was recently elected president and am the newsletter editor for NAR section 500, The Southwest Michigan Association of Space-modeling Hobbyists (SMASH). I am also a founding member of the IAR (Independent Association of rocketry)." "I am NAR level 1." "Now that's a hard one. I never really had a favorite kit, though I always thought the Estes Interceptor was always pretty cool. Right now my favorite in my fleet is a toss up between my Blue Blade X3 and my LOFT projects. I'll dig out the pics on the LOFT. It used to be used by Tim@Apogee as a freebie plan. I also up-scaled it from BT50 to BT60 size. " "Well, our section held the first "official" NAR F/F Sport Scale event at our spring 1999 contest. I placed 2nd with a Friede rocket from the German 1930's Fritz Lang film "Woman in the Moon". I "kit-bashed" it from a Fat Boy. A few of our section members volunteered to be judges/helpers for the US Aerospace Challenge last spring. At the judging they had a guest astronaut come in to speak to the students. It turned out to be Story Musgrave (sp). That was a nice surprise." "Like what??? Heck I don't know. I almost exclusively scratch build. I think I have maybe 6 kits. Building your own designs is the appeal of rocketry for me."